While I don’t usually read horror books, the only ones that I have read were written by Stephen King. Consequently, when I found that he had written a book about writing, it struck me as an opportunity to get into the head of a prolific and successful writer. As a writer of novels myself, I am always looking for ways to improve my writing. I have come a long way in eight years, and King’s little book here merely confirms that I’m doing the right things that a writer should do to help their craft. 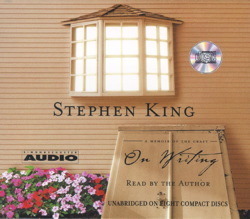 Written as a half-memoir, On Writing is a personal look into the upbringing and life of Stephen King, which then helps inform what and how he writes. Suddenly, you start to understand why he writes the things he does. Intermingled amidst these moments of becoming the writer he is today, King sprinkles in abundant gems of wisdom for anyone looking to start writing (or even anyone who has been writing for a long time). There are a lot of “sound bites” in this book that can be used as motivational inspirations to either start writing, keep writing, or what not to do while you’re writing. Anyone who aspires to be a writer has likely already seen these tidbits on Facebook and Pinterest memes. One word of caution: Stephen King swears. Anyone who has read his other books would know this, but if you’re sensitive to this language, perhaps this book isn’t for you (and you should stick to the writing advice tidbits you can find online). I don’t mind it, but it could be distracting to those with more sensitive ears. While On Writing was a great encouragement to me as a writer, with plenty of reinforcements and reminders of what I’m doing right (and what I still need to fix), I encourage anyone interested in writing to pick this up and read it for some solid advice. Perhaps the best book I have ever read about writing, I give On Writing 5.0 stars out of 5.